Monday, June 20, 1859.Springfield, IL. In U.S. Circuit Court Beaver v. Taylor & Gilbert is submitted without argument and taken under advisement. Lincoln appears for defendant. Illinois State Journal, 21 June 1859. Lincoln writes to Ohio Governor Salmon P. Chase about the Republican Party's platform. Lincoln and Chase differ on whether or not the Republicans should advocate for the Fugitive Slave Law's "repeal." 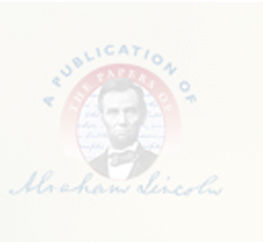 Lincoln ponders Congress's "constitutional authority," and writes, "But I did not write you . . . with any view of discussing the constitutional question. My only object was to impress you with what I believe is true, that the introduction of a proposition for repeal of the Fugitive Slave law, into the next Republican National convention, will explode the convention and the party." Abraham Lincoln to Salmon P. Chase, 20 June 1859, CW, 3:386. Lincoln & Herndon collect $20 for services to David Westfall estate. Probate File.